Our 2nd and final week at National High School has finished, and what an inspiring and productive week it was. Brian and I continued our work in teaching more musical vocabulary which allowed us to use these terms when creating the pieces for our final performance. Here is a day-by-day look at what we did! 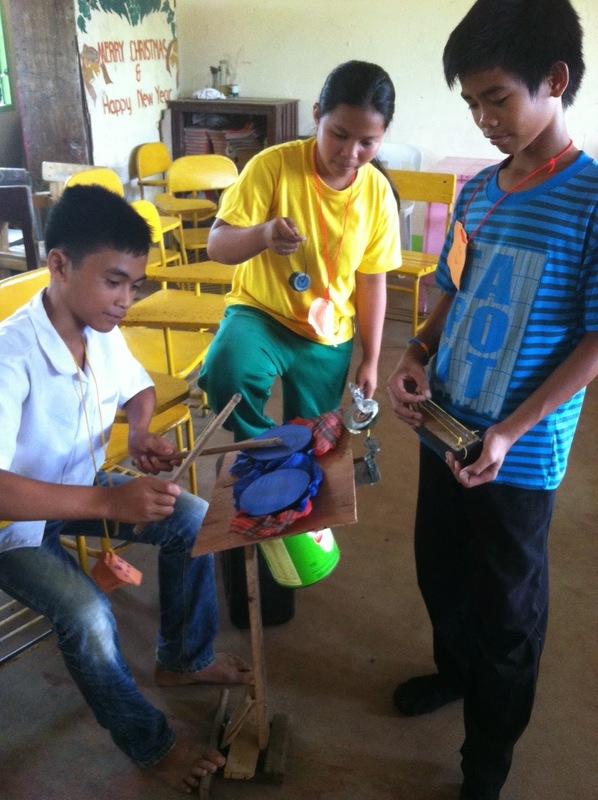 We began today's lesson with a sharing time where the students demonstrated their homemade instruments for their peers. They were incredible!! From bottle cap tambourines to coffee can drum sets to clothespin castanets, each one had a unique sound and design. The resourcefulness was astounding, and the quality of the instruments' sounds were quite great. I was very moved by their creativity. We asked the students to explain the intention of their instrument in performance. What is its role? How should it be played? What is necessary for it to be played convincingly? We moved on in the lesson to study melody and accompaniment. Using their new instruments, and new knowledge of ostinato, the students were to create rhythmic accompaniment figures to be paired with a folk/pop/childhood song which they selected. This composing experience focused their listening to Stravinsky's Suite for Petit Orchestra, Mvt. 1, which uses repeated accompaniment figures to assist a folk song melody. Since a question came up from a student about the person standing at the front of the orchestra, we discussed conducting today. By warming up with identifying the pulse and learning the beat patterns of pieces in 2, 3, and 4, the students were then ready to collaborate in small groups to create their own conducting systems to show changes in tempo, pitch, and dynamics. Each group demonstrated by singing a simple song they learned in theater class, "Dum Dum Da Da". I was impressed with their team work in developing these complex communication systems, and when finding new ways to problem solve together. A big theme in today's word of the day was specifically focused on trusting yourself and this was very important in music class. We asked the students to use their knowledge of pulse, structure, and expression in music to compose songs using quotes form their personal Project Philippines journals. By filling in blanks and prompts, each of the 3 classes composed a song that had a refrain and 3 episodes in rondo form that used themes from our arts workshop so far. I want to be an artist. I want to share my talent. I was to be an explorer. I want to know it all. I want to be an engineer and teacher. I was to be a police and soldier. I believe I can do anything I want. I believe in myself to be happy always. I hope that I'll have wings, I hope that I can fly. I hope to finish my studies, I hope to be a scholar. I hope I will explore, I hope I will travel around the world. Oh, my goal is to succeed in my dreams. Oh, my goal is to help people. My goal is to finish my studies, my goal is to do my best. My wish is to enhance myself, my wish is to have a beautiful life. I am a god's soldier. I am a good person, but I am not perfect. I am honest, I am happy. I am proud to be a Filipino, a Filipino. Confidence is the thing non one can take from you. Confidence is important to me. It is about being proud of yourself. Confidence is believing in yourself and being brave in front of the audience. I'm most confident when I perform my talent. I believe I can anything I want. I am confident in everything I did today! To me confidence means to express your feelings and to believe what you can do. I am most confident when I'm showing myself. I am confident in everything I did today, I can do anything I want. To me confidence means showing and expressing yourself. I am confident when I know what to do. I believe I can do anything I want. I am confident in everything I did today. Class 3: "This Act of Love"
I can give a present but presents can break. I would rather give a song to keep forever. I would rather give love because love is unity. hug, and care for me when I was sick. Then I felt better and happy. This act of love was a gift to me, and I will share the love. I felt love when I was alone in my dark room. Then my friends and family were at my back to support me. My dark room was lit up with love and care. This act of love was a gift to me, I will share the love. I will share the love. I felt love every time I saw your smile. I wish that I had one more hug and kiss. I'll wait for you I promise you again. This act of love was a gift to me. I was so proud of the students for really opening up and doing a brave thing in writing lyrics and melodies together, and wow, how beautiful these words turned out! To test their focus today in preparation for our final performance, we studied a kind of music that is very special to Brian and I. Recently invented in America, Soundpainting explores real time composing with a conductor showing simple gestures which provide cues for musicians. With our students, we used gestures to sign long tones, hits, ostinati, selected songs, all with manipulations in tempo, level, and dynamics. The students had to quickly react to our gestures and used their voices, body percussion, and their homemade instruments to respond to do so. Here is a video of Brian conducting a soundpainting warm up with the students! Not only is soundpainting exhilarating and beautiful as art, but it is also so important to me that we introduce our students to a new definition of music. Based on our evaluation of the students at CNHS, their definition of music is the pop songs they hear on the radio. But for me, being very passionate about minimalism and new music, the definition of music is simply any organized sound. In studying soundpainting, the students were able to better grasp this new definition and see that music is all around them every day. Today was our last day of classes before the students' big community performance tomorrow! We spent the whole day reviewing and rehearsing our pieces for tomorrow's show. Each class will perform their group song, and we will all perform a giant soundpainting symphony called "A Day in the Life of a CNHS Student". I can't wait for them to show everything they've worked hard to learn! Since today's word was community, the students all worked together within their new Project Philippines community to create a banner for tomorrow's performance with visual art teacher, Kyle. They used vegetables and fruits to print and fill in the banner! Love it. The community that I belong to is care all around me. Like my friends, family, classmates, relatives, and Project Philippines. And that love is my community. Then to wrap up the workshop, the students were given small slips of paper to send anonymous affirmations to each other. An affirmation could be anything from "I really loved your dance move in class today" to "You always have a beautiful smile!" This is such a fun activity so the students really feel love among their peers. These affirmation pockets hung next to the list of words of the week. For me, these 2 images really represent the love in the room, and the learning that happened with how these words relate to all the art forms.